Do you remember where you were the summer you left your teenage years behind and turned 20? Well, I was working as a laborer in my hometown in Northern Quebec trying to make enough money to get back into law school. It was a tough job, but I was safe and secure and had the added benefit of my mother’s home cooking every night. On September 2nd, 1944, as we have just heard so eloquently from Jon [Meacham], 20-year-old Lieutenant George Bush was preparing to attack Japanese war installations in the Pacific. He was part of a courageous generation of young Americans who led the charge against overwhelming odds in the historic and bloody battle for supremacy in the Pacific against the colossal military might of Imperial Japan. That’s what George Bush did the summer he turned 20. Many men of differing talents and skills have served as president, and many more will do so as the decades unfold, bringing new strength and glory to these United States of America. And 50 or 100 years from now, as historians review the accomplishments and the context of all who have served as president, I believe it will be said that in the life of this country, the United States, which is, in my judgment, the greatest democratic republic that God has ever placed on the face of this earth, I believe it will be said that no occupant of the Oval Office was more courageous, more principled, and more honorable than George Herbert Walker Bush. George Bush was a man of high accomplishment, but he also had a delightful sense of humor and was a lot of fun. At his first NATO meeting in Brussels as the new American president, he sat opposite me, actually, that day. George was taking copious notes as the heads of government spoke. We were all limited in time. But, you know, it’s very flattering to have the president of the United States take notes as you speak, and even someone as modest as me threw in a few more adjectives here and there to extend the pleasure of the experience. 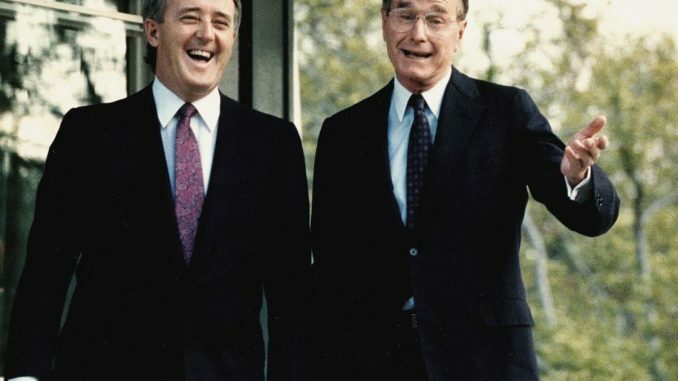 This file photo taken April 28, 1988, shows then-Vice President George Bush (R) as he shares a laugh with Canada’s Prime Minister Brian Mulroney. In the second year of the Bush presidency, responding to implacable pressures from the Reagan and Bush administrations, the Soviet Union imploded. This was, in my judgment, the most epical event, political event, of the 20th century. An ominous situation that could have become extremely menacing to world security was instead deftly challenged by the leadership of President Bush into the broad and powerful currents of freedom, providing the Russian people with the opportunity to build an embryonic democracy in a country that had been ruled by tsars and tyrants for over a thousand years. And then as the Berlin Wall collapsed soon thereafter and calls for freedom cascaded across Central and Eastern Europe, leaving dictators and dogma in the trashcan of history, no challenge, no challenge assumed greater importance for Western solidarity than the unification of Germany within an unswerving NATO. But old fears in Western Europe and unrelenting hostility by the military establishment in the Soviet Union and the Warsaw Pact rendered this initiative among the most complex and sensitive ever undertaken. One serious misstep and this entire process could have been compromised, perhaps irretrievably. There is obviously no more knowledgeable or competent judge of what really happened at this most vital juncture of the 20th century that Chancellor Helmut Kohl of Germany. In a speech to a parliamentary commission of the Bundestag, Chancellor Kohl said categorically that this historic initiative of German reunification could never, ever have succeeded without the brilliant leadership of President Bush. Much has been written about the first Gulf War. Simply put, the coalition of 29 disparate nations assembled under the aegis of the United Nations, including for the first time many influential Arab countries, and led by the United States will rank with the most spectacular and successful international initiatives ever undertaken in modern history. Designed to punish an aggressor, defend the cause of freedom, and ensure order in a region that had seen too much of the opposite for far too long, this was President Bush’s initiative from beginning to end. President Bush was also responsible for the North American Free Trade Agreement, recently modernized and improved by new administrations, which created the largest and richest free trade area in the history of the world, while also signing into law the Americans with Disabilities Act, which transformed the lives of millions and millions of Americans forever. President Bush’s decision to go forward with strong environmental legislation, including the Clean Air Act that resulted in the acid rain accord with Canada, is a splendid gift to future generations of Americans and Canadians to savor in the air they breathe and the water they drink, in the forests they enjoy and the lakes, rivers, and streams they cherish. There’s a word for this. It’s called leadership. And let me tell you that when George Bush was president of the United States of America, every single head of government in the world knew that they were dealing with a gentleman, a genuine leader, one who was distinguished, resolute, and brave. I don’t keep a diary, but occasionally I write private notes after important personal or professional events. One occurred at Walker’s Point in Kennebunkport, Maine on September 2nd, 2001. Mila and I had been spending our traditional Labor Day weekend with George and Barbara. And towards the end, he and I had a long private conversation. My notes capture the moment. As I looked over the waters of Walker’s Point on that golden September afternoon in Maine, I was reminded of the lines, simple and true, that speak to the real nature of George Bush and his love of his wonderful family and precious surroundings. There are wooden ships, there are sailing ships, there are ships that sail the sea. But the best ships are friendships, and may they always be.